Three weeks ago, Yosemite National Park instituted the biggest closure the park has seen in decades, and on Sunday park officials decided to extend it indefinitely. The Ferguson fire, which is one of 18 fires currently active in the state, is to blame. According to Forbes, the 95,000-acre fire grew an additional 8,000 acres this past Sunday and now is severely impacting park roadways. 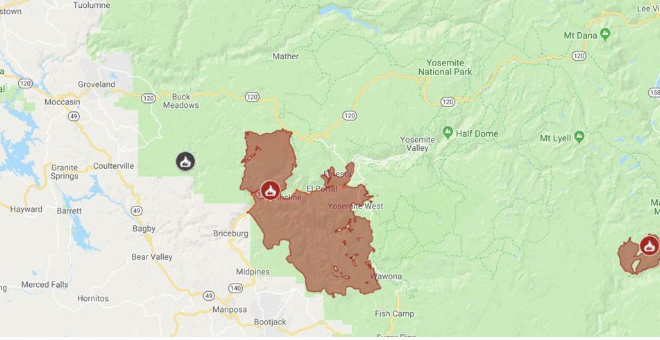 Yosemite National Park released a statement, stating that in the last 48 hours all roads used to access the valley have been affected and are thus facing the closure. The size of the Ferguson Fire. Google Map Crisis Response photo. Fallen trees have made many of the roads inaccessible and too dangerous for tourists. Meanwhile, this fire continues to be an extremely difficult one to fight. There has been no growth as of last night, but firefighters are channeling their efforts to the northeastern section to keep it from spreading into the North and South Rims of the Valley. According to the Sierra News Online, with 43 percent containment, residents have been permitted to return, but the full park opening date has yet to be determined.